Put together your very own Westeros! 4D Puzzle from the hit Game of Thrones series is the ultimate puzzle-building experience. Three layers with 1,500 pieces to teach you all about the Game of Thrones lore! 4D Cityscape now introduces the office puzzle for Game of Thrones, based on the award-winning HBO series. 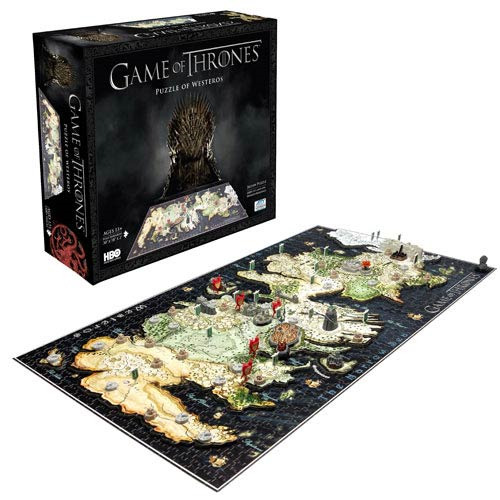 This Game of Thrones Guide to Westeros 4D Cityscape Puzzle will guide players through the assembly of the map of Westeros in patented multi-layer action. The 1st layer is a 1,000+ piece jigsaw puzzle that will teach you all about the various locations and regions of Westeros in astonishingly accurate detail. The 2nd layer is an artistic 200+ piece jigsaw puzzle that, once assembled, replicates the current landscape based on the famous locations of the series. The 3rd layer adds 3D miniature replicas that you insert into the puzzle, including famous cities, castles, and models such as King's Landing, Winterfell, Pyke, Dragonstone the Wall, and Casterly Rock! There are over 50 map markers. Explore the locations that played pivotal roles in the series with unique markers for each! When fully assembled, the 4D puzzle measures 30-inches wide x 18-inches long x 2-inches tall. 1,500 pieces.